Combine the Arborio rice, chicken broth and water in a large pot over high heat and bring to a boil. Stir in the thyme sprig, butter, 1½ teaspoons of the kosher salt, and ¼ teaspoon of the fresh ground black pepper. Reduce the heat to medium-low, cover and cook until the rice is tender and most of the liquid has absorbed, about 15 minutes. Remove the rice from the heat and take out thyme. Stir in the half-and-half cream. Cover to keep warm. While rice is cooking, cook the bacon in a large cast-iron skillet over medium heat, until crisp, about 10 minutes, turning occasionally. Transfer the bacon to paper towels to drain, reserving the drippings in the skillet. Crumble the bacon and set aside. Place the skillet with drippings over high heat and add the corn. Cook until the corn begins to char, about 4 minutes, stirring often. Remove the corn from the skillet using a slotted spoon and stir into the cooked rice. Place the skillet with the remaining drippings over medium-high heat. Sprinkle the sea scallops with the remaining ¼ teaspoon each of kosher salt and fresh ground black pepper. Sear the sea scallops in the hot drippings until charred, about 1 minute per side. Stir the bacon into warm rice. 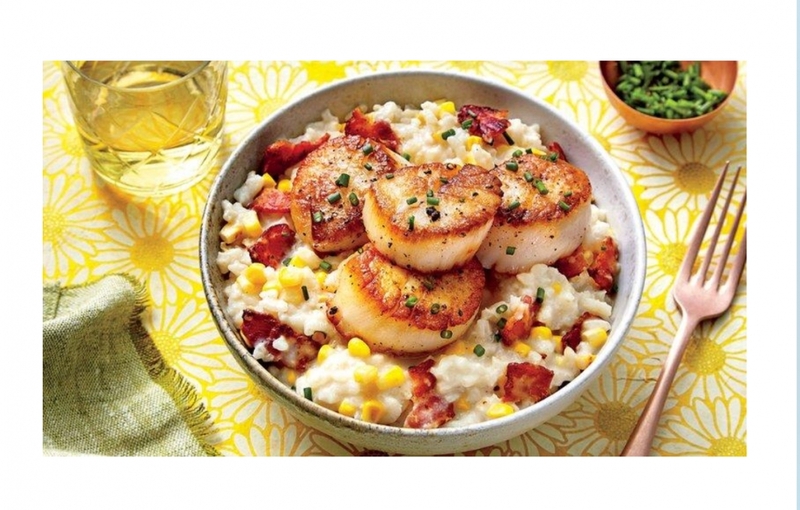 Serve in bowls the sea scallops over the creamy rice mixture garnished with the chopped chives. In Relationship for Themselves Part 1? NYC! Welcome to NYC!